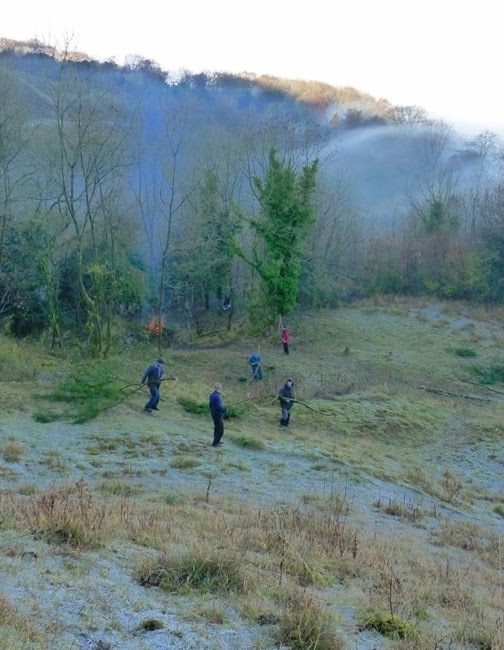 The last two Wednesday work parties at Heyshott Escarpment have been well attended, with a total of twenty participants representing both the Murray Downland Trust and Butterfly Conservation Sussex Branch. 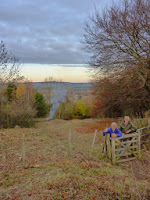 The work has involved cutting back Hazel scrub and invasive Ash so that a new fence can be erected. This will allow for controlled grazing of selected areas of the reserve, providing the mosaic of habitat types necessary to keep a wide range of species happy. The clearance is equally important in allowing more light to penetrate areas of floristically rich grassland which are currently too shady for many invertebrates, including butterflies. 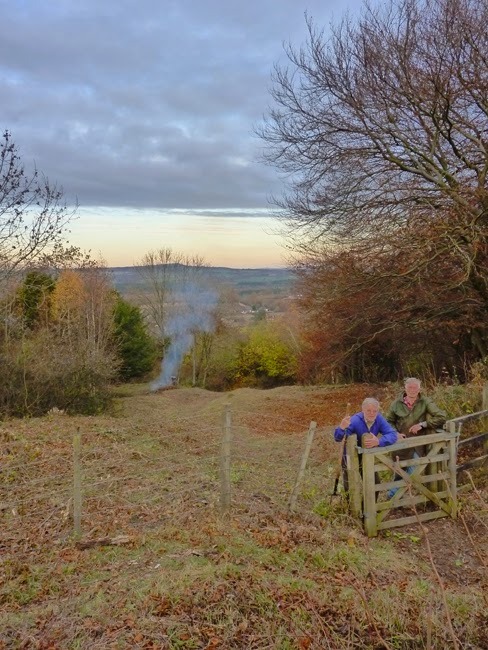 The images show recent work close to the eastern entry point from the path known as ‘Old Chalky’, and around pits in the central part of the reserve. Although my own journey to reach Heyshott each week is quite a long one, it takes me through some of the most scenic parts of West Sussex, over Bury Hill, past Lord’s Piece, and along the dam wall of the beautiful Burton Mill Pond. 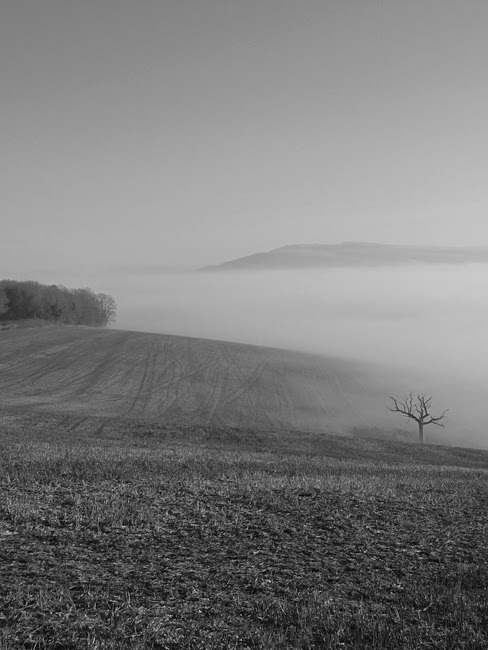 On my way to the most recent work party (11th December) the usual, panoramic view from the top of Bury Hill was obscured by a thick shroud of mist, which filled the Arun Valley floor. 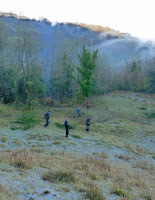 After stopping briefly to take a few photographs I soon descended below the mist-line and only climbed back through it as I approached the group of volunteers already busy at work on the slopes. 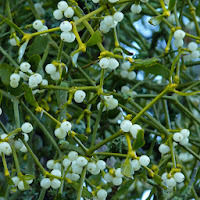 Once the day’s work was complete, I headed to the western flank of the reserve to collect some Mistletoe for the house. Mistletoe (Viscum album) is a hemi-parasitic plant which grows on a wide variety of host trees, most notably the cultivated Apple. The sticky seed attaches to and pierces the branch of a host using a structure called the haustorium, through which it steals mineral nutrients and water. It does do some work itself, manufacturing photosynthetic products (sugars) via its evergreen leaves. 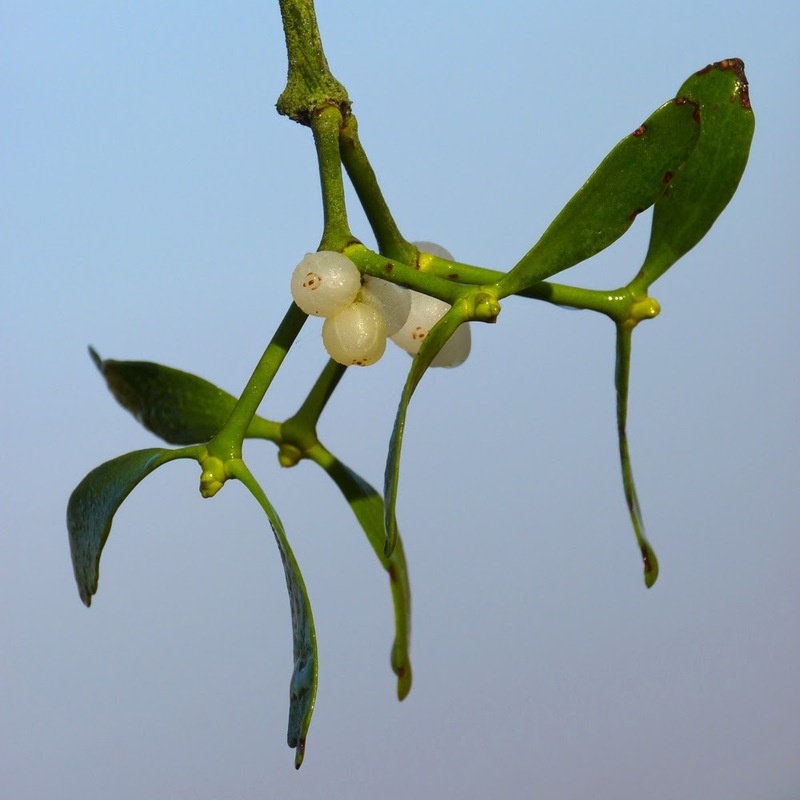 Mistletoe is only really common in the S and SW Midlands, and occurs quite sparingly across Sussex. However, it grows on several trees on and around Heyshott Escarpment, typically set in open locations. One tree in particular is smothered in the plant, undoubtedly to its detriment; too much Mistletoe will stunt and can even kill its host. 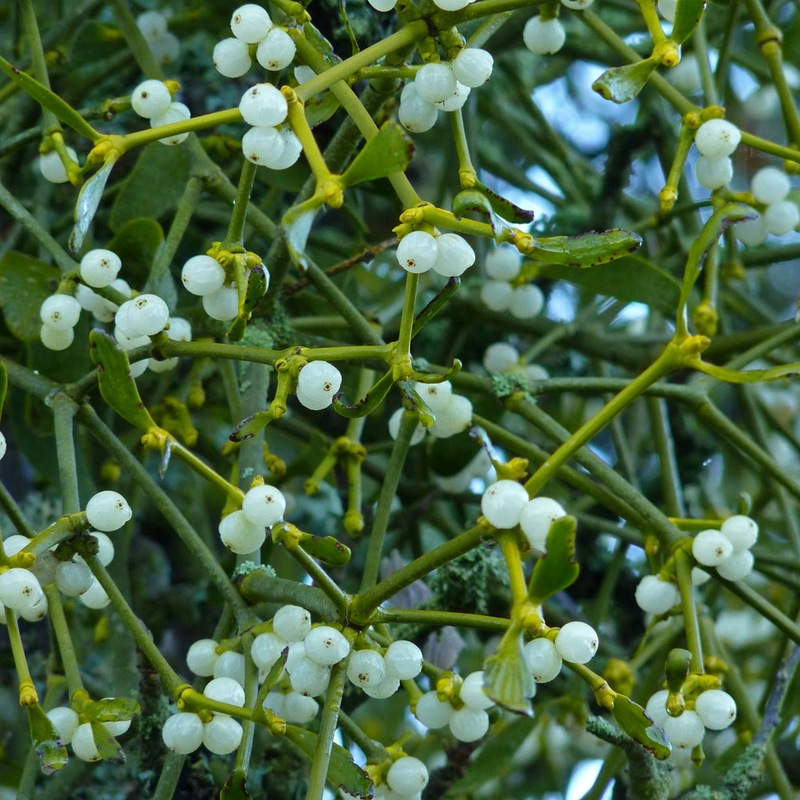 Mistletoe, or at least our native species, is distributed by the winter activities of birds, most famously by the Mistle Thrush. I flushed two of these birds as I approached. After feasting on the white berries the thrush will excrete sticky, semi-digested pulp and seeds, which might stick to a fork or cleft in a tree and then germinate. The Mistletoe Matters Consultancy considers that the distribution of the plant may be increasing, possibly due to the increased activity of another bird. The Blackcap is apparently more efficient at placing seed in suitable locations, as it tends to wipe the seeds from its beak on branches, having only ingested the pulp. This member of the warbler family used to invariably migrate south to mainland Europe. However, with climate change, an increasing number now stay with us to over-winter in the UK. Please note that the next Heyshott work party (Wednesday 18th December) will be the last before we reconvene on Wednesday 8th January 2014.